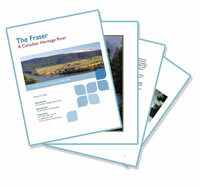 Healthy watersheds and water resources are a focus for the Fraser Basin Council. You’ll find examples of our water work in each region. Here are some of our past projects. FBC oversaw a Collaborative Watershed Governance Initiative (CWGI). Central to the initiative was a proposed Collaborative Watershed Governance Accord, which sets out principles for sustainable watershed management. The Fraser Salmon and Watersheds Program (2006-2012) brought together watershed stewards from across the Fraser Basin for networking, shared learning and collaboration. FBC has since worked to foster, maintain and strengthen these connections. We’ve surveyed stewards and found there is particular interest in workshops and field tours on such topics as planning and governance, public education and engagement, and restoration work. There is also support for collaborative approaches to applied research. FBC hosted a series of workshops in 2012-2013 around BC under this initiative, thanks to the BC Living Rivers Trust Fund and other funders. As well, our Thompson regional office takes the lead on the annual BC Interior Stewardship Workshop. To learn more, contact Senior Program Manager Steve Litke. In 2011-2012 FBC developed a framework of indicators for the health of watersheds and water resources, with funding from Environment Canada. The framework is based on a review of current indicators, data availability and information priorities of local and regional organizations. We are also testing online mapping and database tools to make data easier to access and disseminate. The Fraser River was designated as a Canadian Heritage River in 1998 in recognition of its exceptional natural, cultural and recreational values. The Fraser: A Canadian Heritage River (10-Year Monitoring Report 1998-2008) summarizes the Fraser's first decade as a Canadian heritage river, positive enhancements in its environmental, cultural and recreational values, and some key challenges in its future. The Fraser Basin Council prepared the report in collaboration with the BC Ministry of Environment. The Ministry then submitted it to the Canadian Heritage Rivers Board. In June 2010, that Board confirmed the Fraser's continued status as a heritage river based on all three values. It’s inspiring to see youth learning, and leading! Thanks to funding from the Fraser Salmon and Watersheds program, FBC has hosted work in the GVSS, Fraser Valley and Upper Fraser to connect and mentor youth (ages 16-24) in caring for local watersheds. Read more in our youth section. In early 2008 the BC Ministry of Environment hosted several water governance workshops, in partnership with Living Rivers (Georgia Basin-Vancouver Island), Fisheries and Oceans Canada and the Fraser Basin Council. It was the start of a dialogue designed to help shape provincial water legislation. FBC served as facilitator, bringing together federal, provincial, local and First Nations participants, along with those in industry, agriculture and stewardship groups who together explored current challenges. See background on Water Act modernization at Living Water Smart. Woody debris in the lower reaches of the Fraser River threatens public safety, navigation, recreation and habitat, especially during spring freshet. Government cutbacks have threatened closure of the Fraser River debris trap on more than one occasion, but FBC has supported the collaborative effort behind it. After serving as secretariat for the multi-stakeholder Fraser River Debris Trap Operating Committee and securing short-term funding agreements for many years, FBC was pleased to see a long-term plan in place as of 2011. The Fraser Basin Council's Executive Director, David Marshall, chaired an independent Drinking Water Review Panel to study the effectiveness of BC’s Drinking Water Protection Act. The Panel looked at the quality and quantity of drinking water, including well water, the security of water systems, infrastructure funding and groundwater protection. In 2002 the Province of BC responded with a Drinking Water Action Plan, investing $16 million in funds to increase monitoring of drinking water. Read the review panel report and current information in the Province of BC’s annual Action Plan update.